Guys...guys!! I'm so excited to share this cake recipe with you. 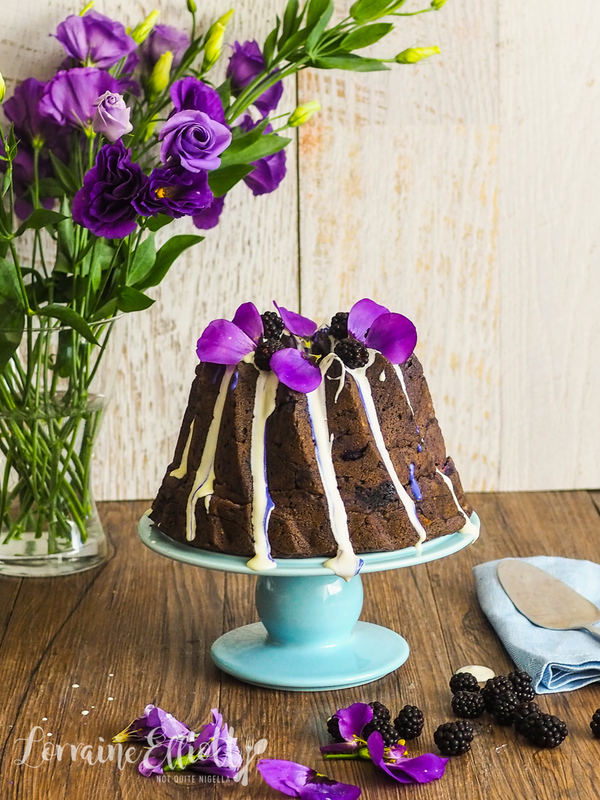 Not only does this sweet potato cake contains freshly cooked purple sweet potato or ube (oo-beh), a popular ingredient in Filipino cooking, but it also makes the most deliciously out of this world moist cake! It even improves with age! Her name? Lila. Sometimes things stuck in your head and many years ago I got my diet reviewed by a qualified nutritionist Lydia Sutakowsky. And it was one thing in particular she said that stuck in my mind: people don't eat enough purple or blue foods. I think everyone knows that you need to eat your greens but purple or dark coloured foods also provide more antioxidants, anthocyanins and flavonoids. Anyway I'm in a full blown obsession with purple food. 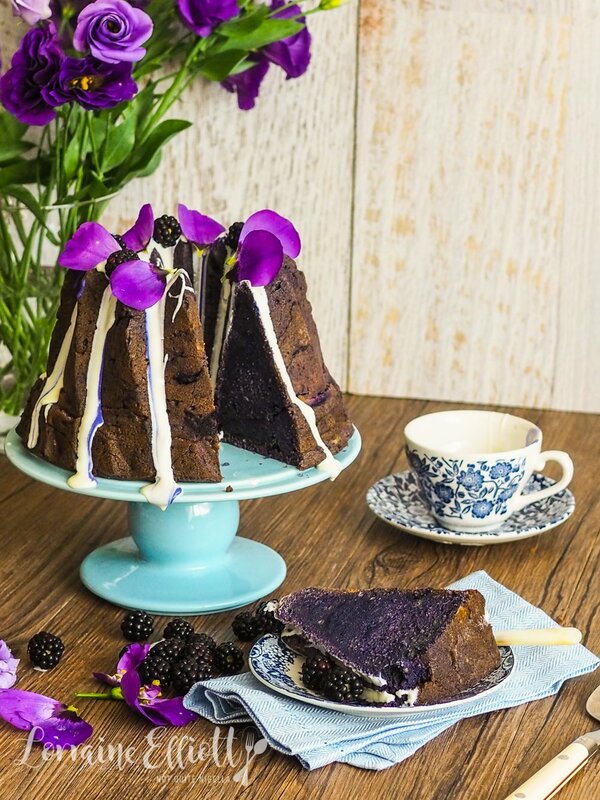 And as soon as I saw purple sweet potatoes at the markets I wanted to make a cake with them. I should also add that ube is actually a yam, not a sweet potato but for the purposes of this recipe, if you can't get ube you can sub it with regular orange sweet potato. Ube is sweet to me, almost vanilla-ey. 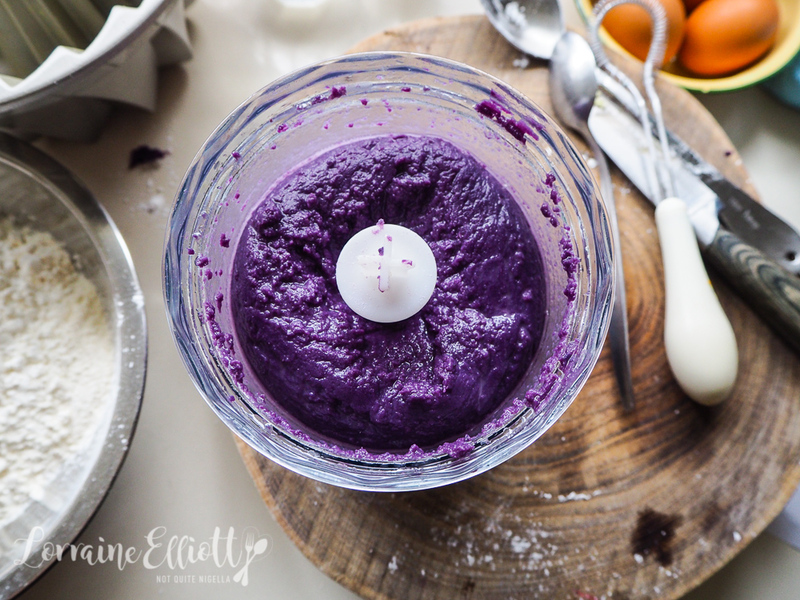 Usually Filipino dessert recipes use ube powder but as I didn't have any powder and only fresh ube, I decided to make a recipe using fresh ube. I bought the ube in this cake before Christmas. Except in the flurry of Christmas prep these got lost and neglected until after New Years. I had brought them along to our mini getaway in the Southern Highlands from the 28th December to the 1st of January. It was something that we started doing last year. It's too crazy to travel overseas during Christmas and truth be told, I tend to find excitement in big cities, I instinctively gravitate towards it and I need the quiet solitude of the country. I just needed to find somewhere suitable. 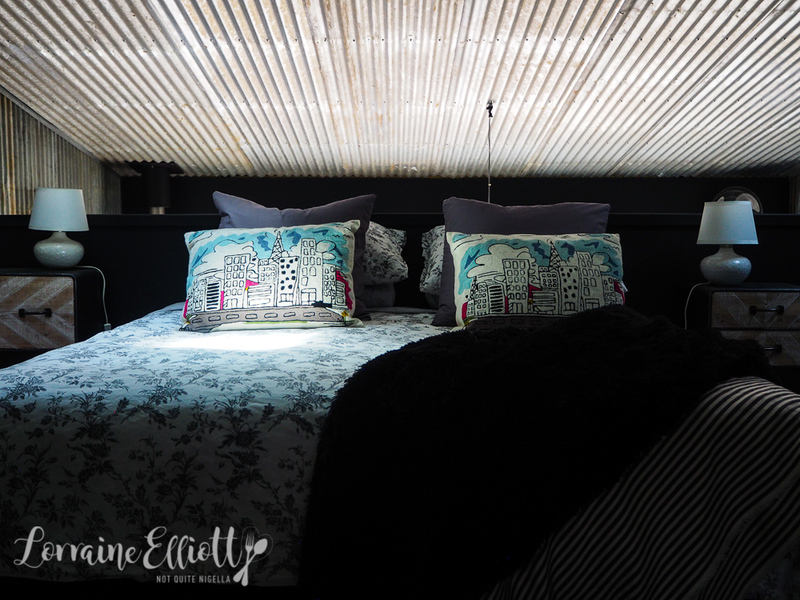 There were two prerequisites: the accommodation had to have a king bed and be dog friendly. The two are related: Mochi may be small but when she sleeps she stretches out and gives gentle little kicks as if she is swimming and a queen bed is just too small. 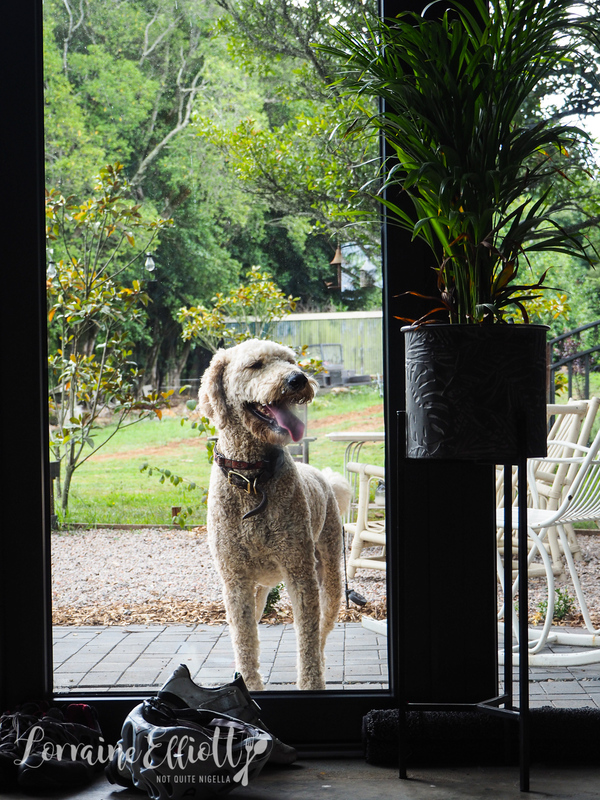 The house that we rented was gorgeous. 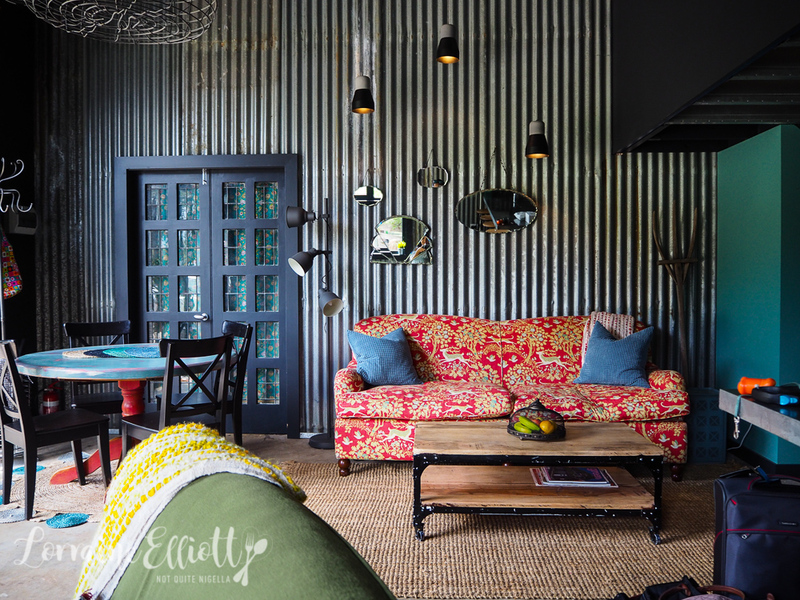 It was actually a converted shed but one with all the luxuries a fussy city girl needs and then some. There were two groodles that took a keen interest in Mochi-their feelings alas were not reciprocated. 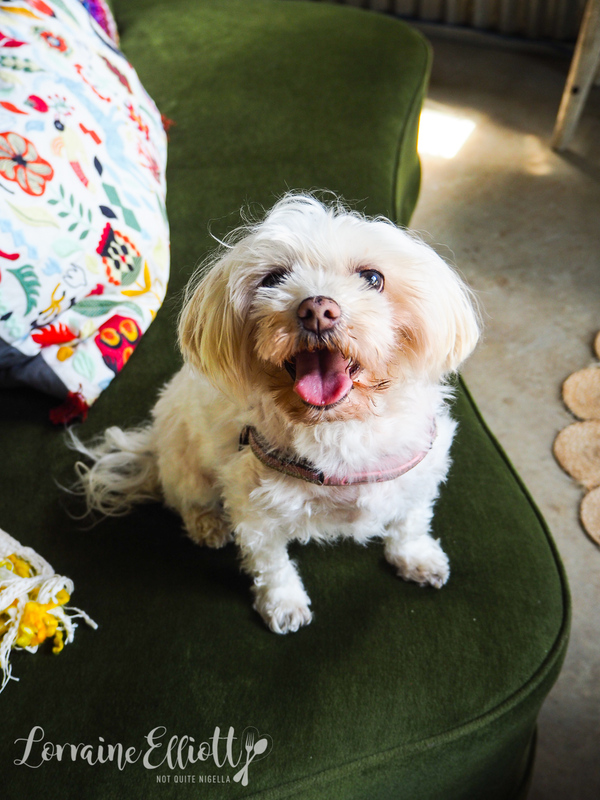 While Mochi adores humans she cool and aloof with other dogs. She's a human you see. 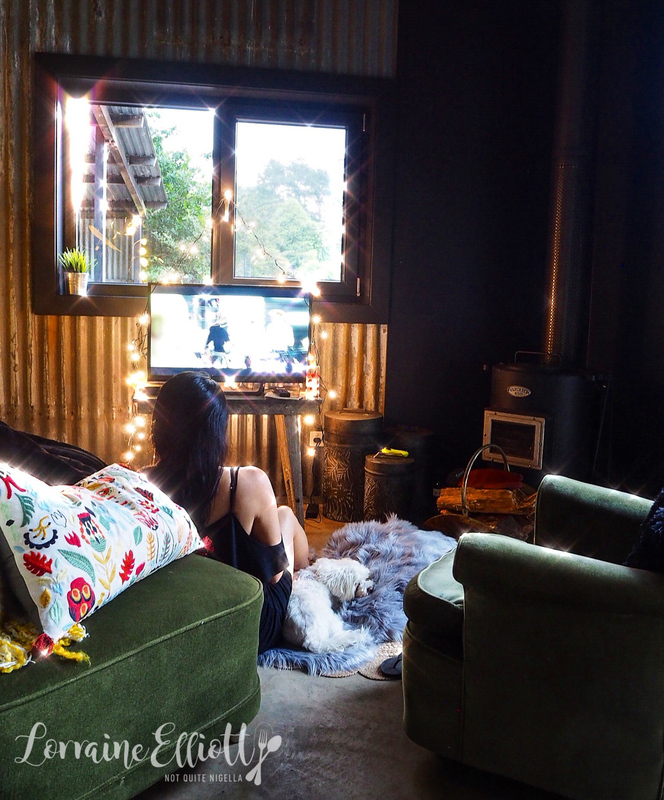 I cooked and Mr NQN cleaned (sort of) and I set myself up a lady cave in the lounge room. This involved lots of pillows, fur throws, drinks and snacks and plenty of tv watching. We watched the new season of Black Mirror (fave episode: Black Museum!) but it was so introspective so we had to chase that with stand up comics (Trevor Noah, Katherine Ryan) and we saw in the new year eating Alaskan crab legs, grilled scallops and smoked salmon with cocktails. Everyone that I knew seemed to have a quiet NYE, and even when the fireworks were on the television, I was busy having a shower and getting ready for bed. 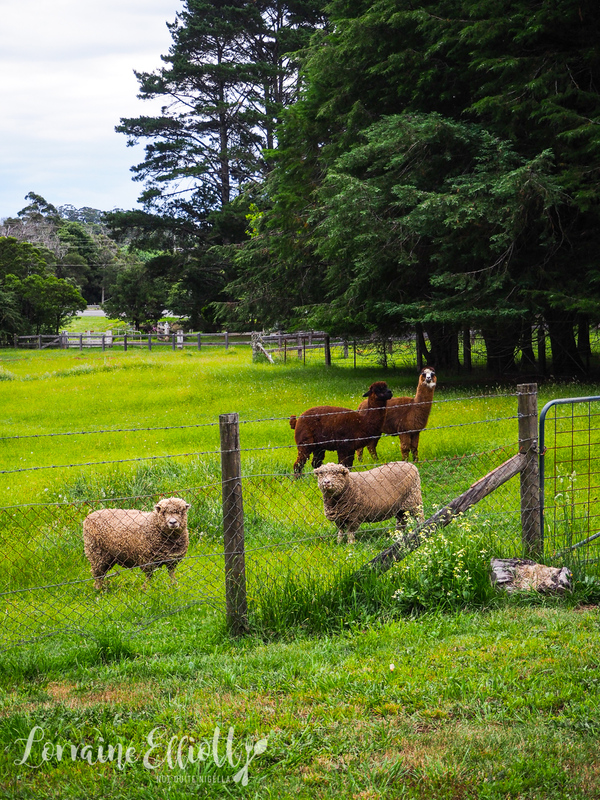 Before we knew it, it was January 1st and we had to be back in Sydney for friends' New Years Day party and we packed up our possessions, said goodbye to the farm's groodles, alpaca and sheep and drove back to Sydney. Anyway I did diverge from these purple sweet potatoes didn't I? They went uneaten, mostly because I didn't have the chance to make anything with them. But then it was my father's birthday on January 1st and my family adore taro cakes. Taro incidentally is also different from ube but that's a whole other story. He also loves healthy food and I figured adding vegetables to a cake would delight him. This was made up sort of on the fly and I wasn't sure how it would turn out but I'm so happy that it worked out so well. The texture of this cake is incredibly moist and fluffy. It's really unlike other cakes in that respect. And don't worry if ube is too hard to find, just use regular sweet potato (and an idea might be to add 2 teaspoons of pumpkin pie spices too). But this is the sort of cake that you find yourself eating lots of because it isn't overly sweet or overly iced. It just sort of tastes wholesome and wonderful. And you couldn't ask for more from a cake could you? So tell me Dear Reader, how did you spend you break? Did you have a low key NYE? I know, it feels like ages ago now! What do you think of this cake? 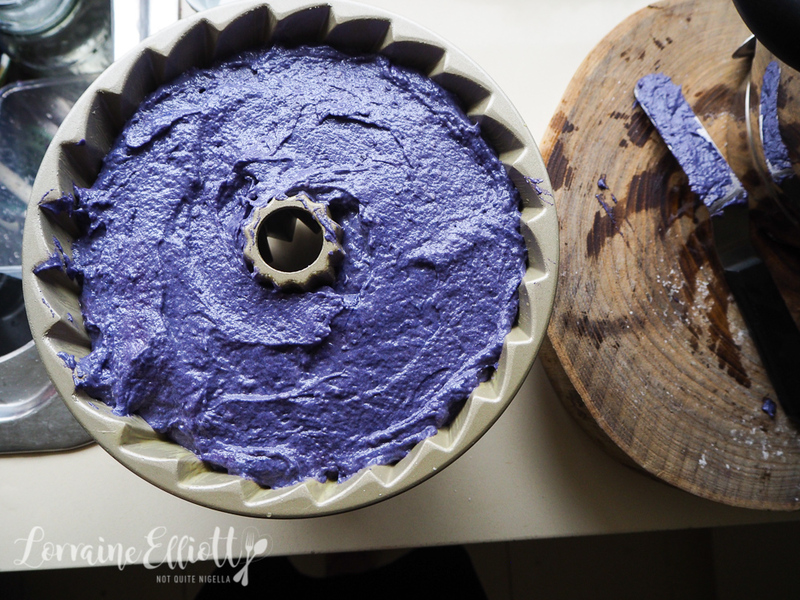 Ube can be purchased at large markets, especially ones that cater to Filipino clientele. I bought the ube at Paddy's Market. White on white colouring is available at cake decorating stores by brands like Wilton. Step 1 - Preheat oven to 160C/320F. Butter a cake tin-I used a bundt tin which was fine but it was a perhaps bit too detailed. Two 20cm/8inch plain tins are best. Cream the butter and sugar until pale and fluffy in colour. Add eggs one at a time and then add the vanilla and purple colouring. Beat until the colour is consistent throughout the mix. 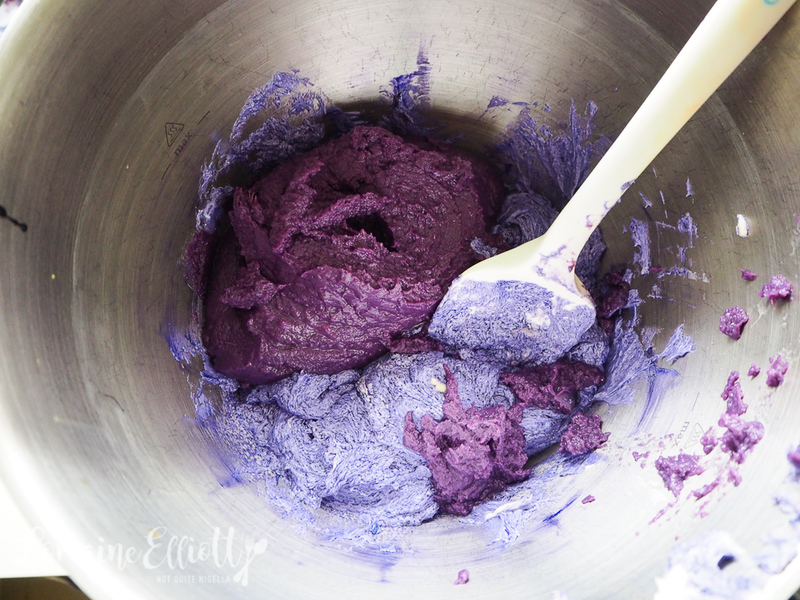 In a food processor, blend the ube and the oil until you get a smooth consistency. Add this into the mixture and mix until smooth. Step 2 - Whisk the flour, baking powder and bicarb in a jug. Alternate the flour and the coconut milk until you get a smooth mixture (try not to overmix). Pour into the buttered tin. Bake for 50 minutes or until the cake bounces back when touched. 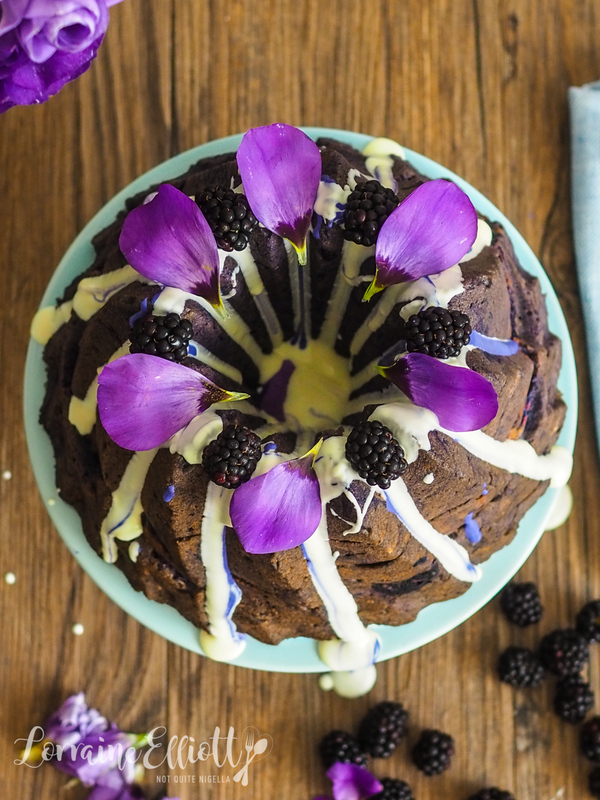 If you don't bake this in a bundt tin then it will take longer, around 15-20 minutes longer or so and make sure that you check the centre. Allow to cool in the tin. Then carefully upend onto a serving plate.